Enjoy of a reliable service in Friern Barnet that has received over 95% of positive client feedback! A: The pros will rinse your windows with proven water-fed pole gadget or use secure ropes and cherry pickers to clean lofty premises. 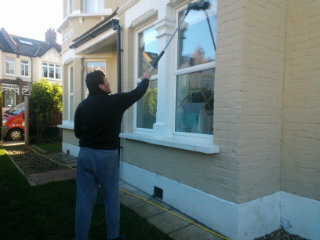 We also offer in-house window cleaning in Friern Barnet, done with the usual ladders and squeegees. A: This convenient tool allows the Friern Barnet window cleaners to wash any skylight, sash window, French door, and other pane varieties on any four-storey property. Q: Why don't you absorb the residual water once your work is complete? A: It's simple – we won't spray your windows with ordinary tap water. Instead, the adepts will remove the grime build-ups with filtrated water that won't tarnish your panes once it dries up. Q: Do I need to prepare in advance for the Friern Barnet window cleaners' appearance? A: You'll need to reserve a free parking space within 30 metres from your domain and on the same side of your road. You'll also need to give the specialists with full access to your property. A: Yes, our services are covered by a detailed insurance policy. In addition, the pros are certified to wash windows big and small, single or double, as well as French doors, door panels and even glass roofs. A: We will readily clean any four-storey or multistorey commercial property. We can also supply you with other maintenance choices, such as gutter cleaning and pressure washing. With our window cleaning in Friern Barnet, you get a quality rinse of your sash windows, skylights, conservatory roofs, French doors, and other glass surfaces at budget prices. We will even provide you with a complimentary wash of all PVC & UPVC frames and sills! For a full list of our prices, please check our price table below. Regardless of where your streaks have taken shelter, our capable window cleaning in Friern Barnet will fight them off with ease. We have covered several washing methods. Our external window wipe is suited for properties with no more than four storeys. To let the sunshine back inside, the window cleaners in Friern Barnet will come in a vehicle, equipped with an extendible water-fed pole. This system is connected to a water storage, filled with purified water. After being released as a powerful flow from the pole's brush-head add-on, the water will absorb all smears in an attempt to renew its natural structure. To access dusty window corners of multistorey properties, we'll send an established team for rope access window washing. These approved abseilers will use well-maintained ropes and harnesses or set up ladders and cherry pickers to bring back the allure of your panes. We've got all important COSHH records in place and follow each safety requirement. To make the in-house surface of your glass façade just as shiny, the pros will utilize the established ladder and squeegee washing method. As our customer base grew in numbers, we augmented our window cleaning in Friern Barnet to encompass other London areas as well. Please refer to our handy list to see which adjacent locations we work with. For those of you who'd rather book window cleaning services Friern Barnet N10 online, fill in our get a free instant quote form.